Check out any forum, listen to a video discussion, watch a podcast and just as often as not you will you find that the question of what to use to compress, and what is the most advantageous codec and settings to use is on the tips of everyone's tongue. Of course, with such a tremendous number of diverse types of projects, different client requests and the peccadilloes of the many, there sadly is no one answer, no single setting, size or format. However, the one thing all agree on is that quality and speed of creation is of utmost importance. Sorenson Squeeze seems to have been around since the dawn of man, or at least, the dawn of non-linear editing. 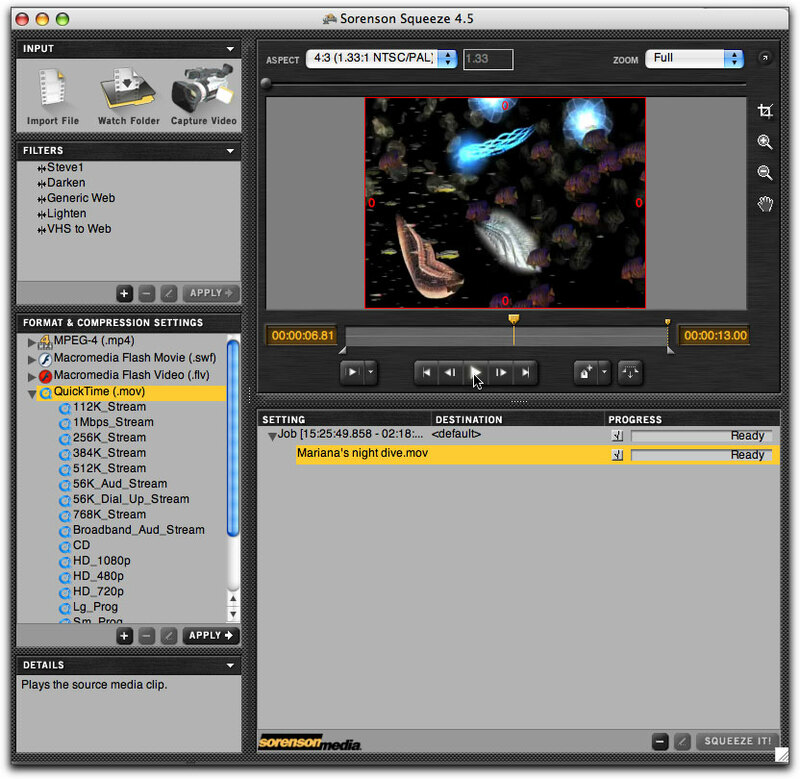 The Sorenson Squeeze 4.5 Compression Suite, capable of running either on a Mac or PC, brings with it several new features and capabilities not the least of which is much improved support for H.264, speed boosts for both pre processing and encoding, the ability to run natively on the Intel based Macs and DVD burning straight to disc. Available either on disc or as a download from the Sorenson website, the installation was certainly simple enough. You need to just run the installation program and enter your serial number to activate and that's it. 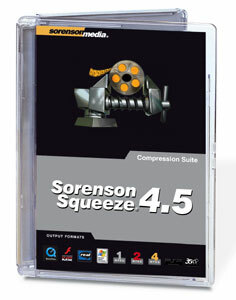 Using the Sorenson Squeeze 4.5 compression suite is quite easy. Importing projects can be accomplished either by dragging your project into the batch window at the bottom, use the import file icon at the top left to locate a project within your computer, use the Watch Folder, where you can compress several source files into different formats without having to manually assign settings for each process, or you may capture your video live by going to the Capture Video icon found in the Input window. 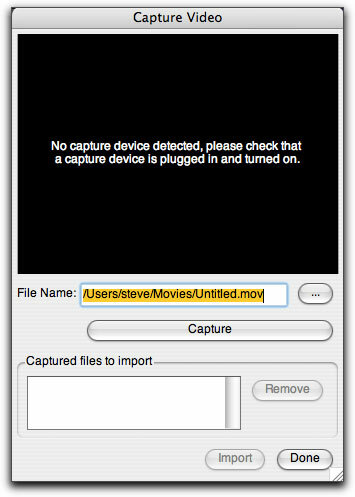 No capture device connected but it is simply done within this capture video window. All the windows found within the Compression Suite interface are easily adjustable as to size in relationship to each other. Need to stretch out or enlarge the video playback window for a closer look at the details; it's no problem. Need a larger batch window for a good look at multiple projects and their assigned filters, easy to do. The video window even has an unobtrusive and easy to over look button at the top right which will completely disconnect the video window from the rest of the interface. Click again and it's reconnected. Very cool! A contextual window found at the bottom of the interface that explains what each thing will accomplish or do clarifies any confusion as to what any of the icons or controls is. At the upper left of the interface are the different filters, which can be applied to improve the final output of your project. Each filter is customizable and may be saved for future projects. 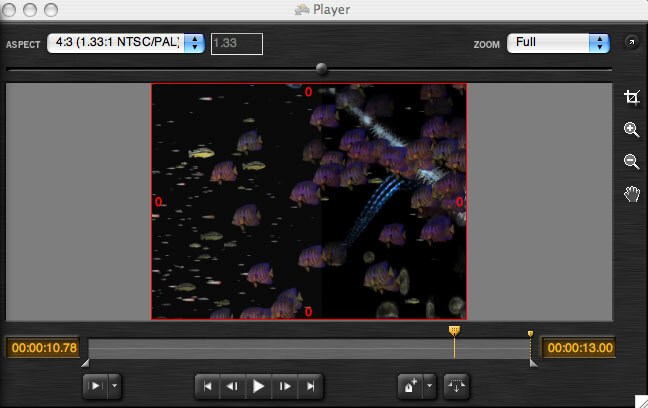 With the application of filters to the project you will find a frame-viewer in the video window that is controlled by a small, sliding button at the top of the video. Sliding this towards center will provide instant feedback as to the changes you are making giving you a before and after preview before deciding to go to final compression. 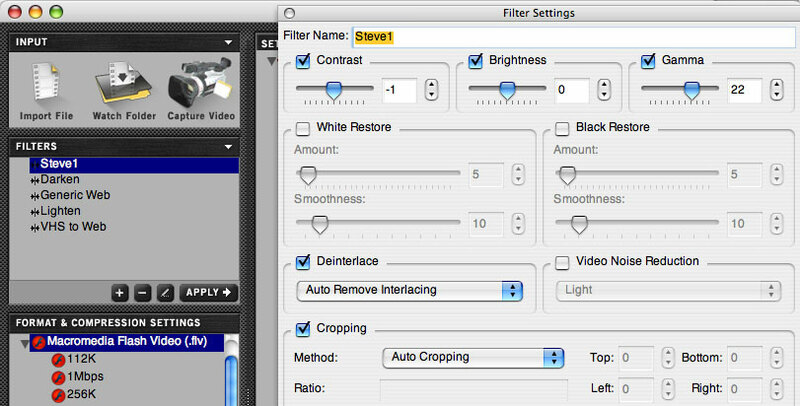 Adjusting the parameters within the savable filter and being able to see instant results may save you lots of time down the line. Using the slider button over the preview window gives you the ability to see your 'before' and 'after' prior to final compression. Squeeze 4.5 allows you to apply as many encoding presets and filters as you want and to as many projects. Just as well because Sorenson provides a great many presets for you to choose from whether you will be making your projects for DVD, streaming, Power Point presentations or CD distribution. Each of the presets is easily modifiable and may be saved for future video encodings. Multiple encodes at the same time for each project or for different projects is very doable. I was impressed by both the speed of the compression and the final quality I was able to achieve with my experimentations. No matter how good an application Squeeze 4.5 is, you must still experiment with different presets and manual settings in order to find the one, or the many, which is best for you. There is no single way to accomplish these compressions, it all depends upon the length, audio, complexity of the video and quality requirements needed by any one project. The Sorenson Squeeze 4.5 Compression Suite does provide you with the opportunities. The choices remain up to you.